Dubai, United Arab Emirates – The Bahamas made a resounding impact in Dubai, gaining the attention of the world and the government of the UAE recently at the second International Participants Meeting (IPM) for Expo 2020 Dubai. 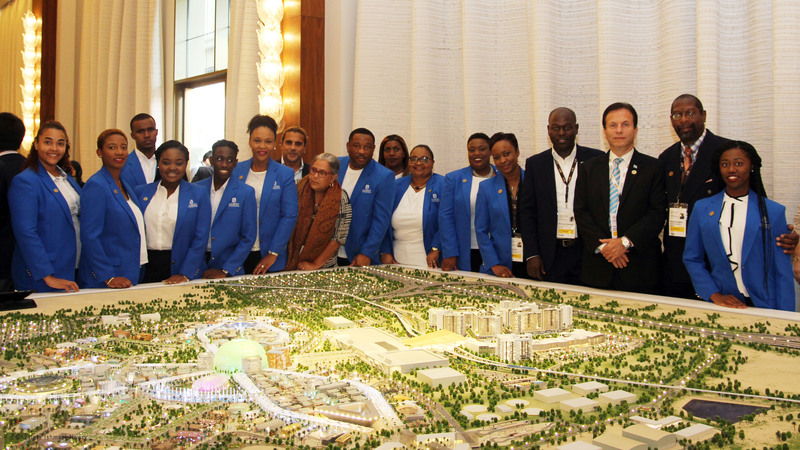 According to Expo 2020 Dubai organizers, the work to date on the Bahamas Pavilion and involvement of the University of the Bahamas (UB) students has become a benchmark for success. More than 500 delegates, representing 150 countries, attended the three-day IPM to discuss and be brought up to date on the progress of Expo 2020 Dubai, slated to be the largest World Fair ever. In attendance were commissioners general, ambassadors, business leaders, as well as government officials and partners like the Bureau International des Expositions (BIE). The Bahamas led the way in meeting the criteria of Expo 2020 Dubai’s vision to utilize and include young adults in the challenge of solving issues affecting their country, and creating solutions relative to the Expo’s sub themes: “mobility, sustainability and opportunity”. Dubai quickly recognized that The Bahamas had tremendous institutional capacity to carry out the program, perceived from earlier virtual meetings with the UB team which links to Expo 2020 Dubai’s Creative Youth Initiative. The Bahamas enjoyed the distinction of being the only participating country to share their story on the world’s stage. UB students Kacey Duncombe, architecture and Marcella Evans-Ingraham- Ingraham, culinary arts, represented their country well in the formal presentation. They shared the story of how Expo 2020 allows one to “dream big and make the impossible, possible”. The Bahamas has an incomparable edge under the leadership of Tony Joudi, non-resident Ambassador to the UAE and the State of Qatar for The Bahamas, who plays an integral part in the process, drawing on his strong diplomatic ties with the UAE. His Excellency led a delegation of 17 individuals representing a multi-disciplinary team that included Project Manager, Michael Diggiss, University of The Bahamas professors: Valaria Flax, Architecture, Michael Edwards, the Visual Arts, Eldred Saunders and Donna Williams, Culinary Arts, Dr. Ian Bethell-Bennett, former Dean of Liberal and Fine Arts, and their students, together with representatives Janet Johnson, Director and Bridgette Rahming of Bahamas Ministry of Tourism’s Business Development Department and Azaleta Ishmael-Newry, public relations and media consultant. Organizers feel that what started as a collaboration between the Bahamas Ministry of Foreign Affairs and the University of the Bahamas is transforming into robust public private partnership opportunities. 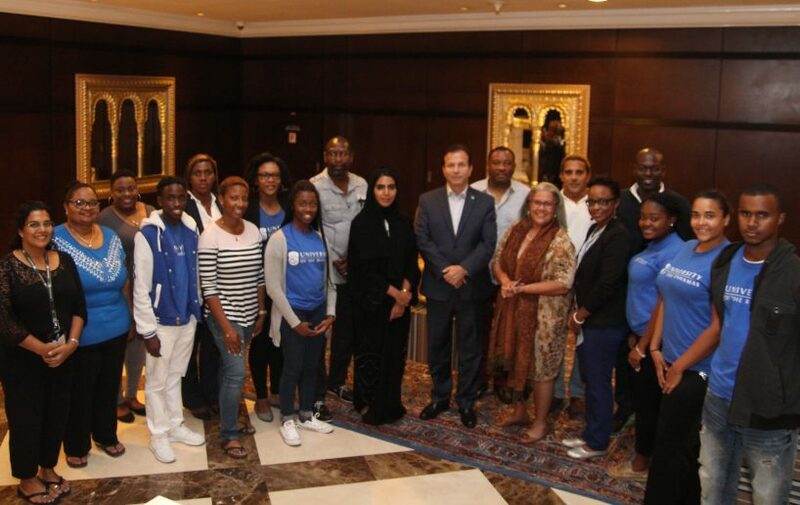 Participation in the recent Expo 2020 Dubai’s International Participants Meeting was made possible by financial support from the Bahamas Ministry of Tourism, Aliv /Cable Cares Foundation and Super Value. 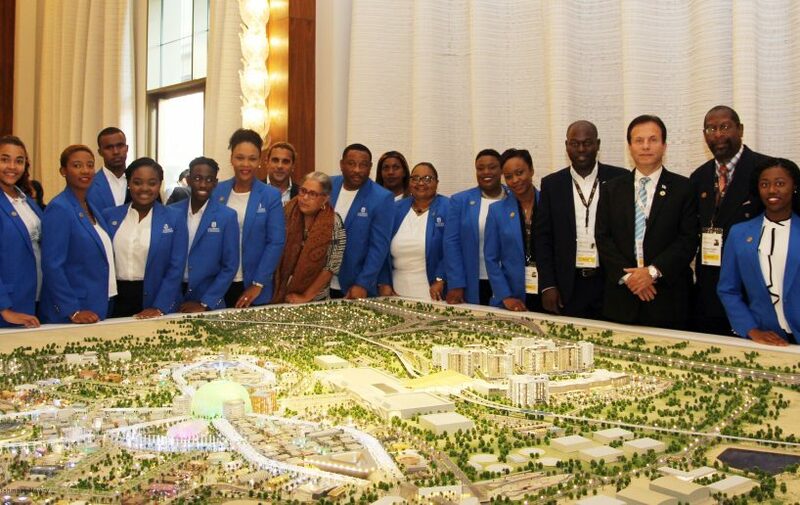 It is anticipated that the Bahamas Expo 2020 team will require a deeper engagement in Dubai. Local sponsorship is critical to advancing this national initiative. Expo 2020 Dubai is a global platform that will create short, medium and long-range business and exchange opportunities. Participating countries will be exposed to approximately 25 million visitors during a sixth-month period, starting October 20, 2020. For persons or companies who wish to be a part of this exciting opportunity, should start planning now. 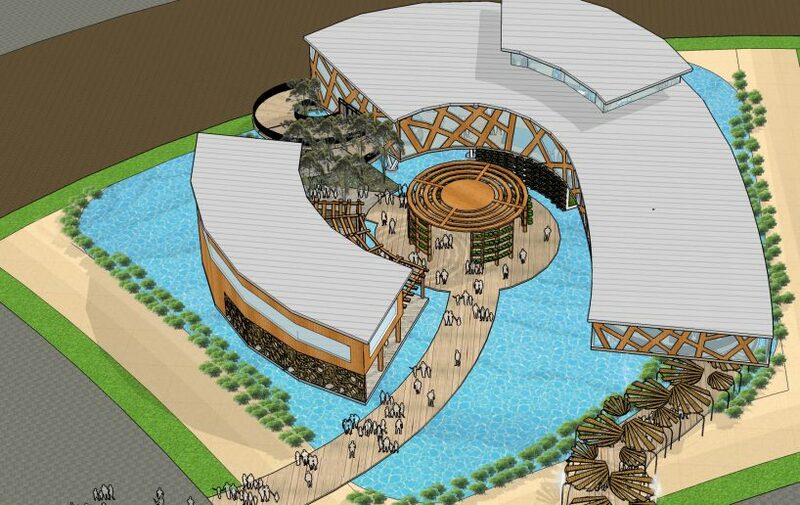 At the IPM, more than 150 countries confirmed participation in Expo 2020 with an expectation that others will follow. Participants were inspired by the work of The Bahamas team and their achievement, and wished to draw upon our expertise. 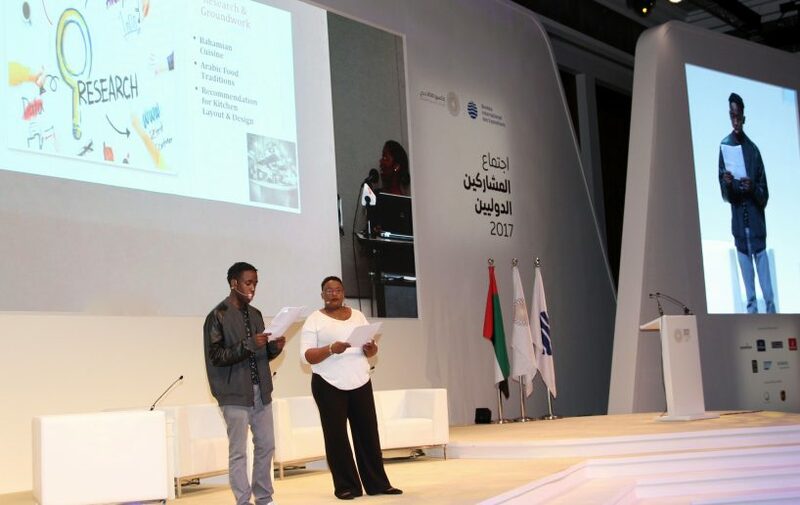 University of The Bahamas architect student Kacey Duncombe, left and culinary student Marcella Evans-Ingraham, right, rehearse on stage in Dubai, UAE, for the presentation of the Bahamas Pavilion at the International Participants Meeting for Expo 2020 Dubai. Bahamas delegation arrive in Dubai, UAE for the Expo 2020 Dubai International Participants Meeting that took place October 18 – 20, 2017. They were greeted by senior international country manager, Hend Al Mheiri at the RODA Al Bustan Hotel. From left to right are: Azaleta Ishmael-Newry, Donna Williams, Marcella Evans-Ingraham, Kacey Duncombe, Bridgette Rahming, Whitney Sturrup, Karen Sherman, Anynke Austin, Michael Diggiss, Hend Al Mheiri, Ambassador Tony Joudi, Eldred Saunders, Janet Johnson, Dr Ian Bethell-Bennet, Valaria Pintard-Flax, Michael Edwards, Alexis Lightbourne, Sheena Heastie and Royce Archer. Bahamas Delegation attended the Expo 2020 Dubai International Planning Meeting event in Dubai, UAE from October 18-20, 2017. They are shown admiring the master plan of the Expo site that is currently under construction. 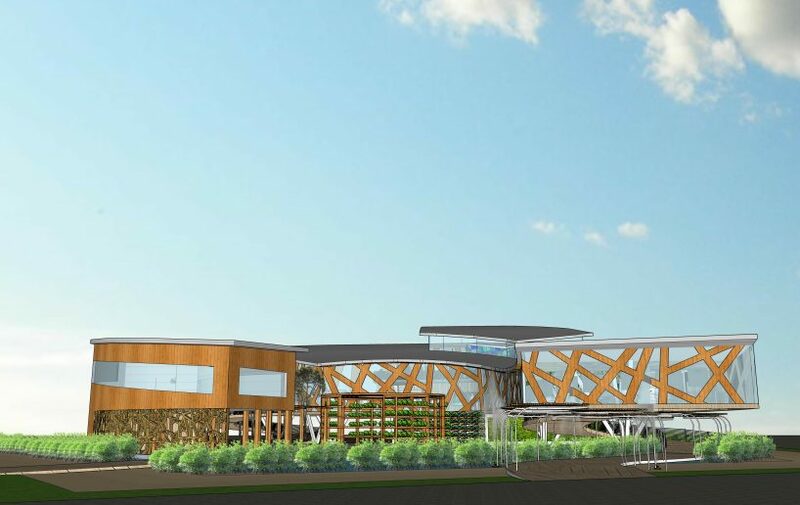 The 1082-acre site close to Dubai’s Al Maktoum airport will be home to the largest World Fair in the Middle East, Africa and South Asia (MEASA) that is expected to draw approximately 25 million visitors over a 6-month period, starting in October 2020. Press release and photos provided by Azaleta Ishmael-Newry.